Today this Pretty Guardian Trainer Mercury shirt, which combines the worlds of Sailor Moon and Pokémon, will be for sale at ShirtPunch. The shirt is for sale January 13th for 24 hours for $10. 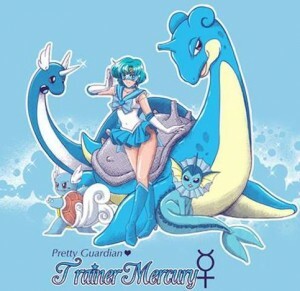 Sailor Mercury’s Pokémon team includes Dragonair, Lapras, Wartortle and Vaporeon. This is the 4th shirt in this series which features Sailor Moon characters as Pokémon trainers designed by Kinkwink. The previous shirts were Pretty Guardian Trainer Venus, Pretty Guardian Trainer Mars and Pretty Guardian Trainer Jupiter. All of these shirts can be found at her Redbubble store. Today, December 20th 2013, this great looking “Sailor Senshi” shirt will be on sale for $10 at ShirtPunch. 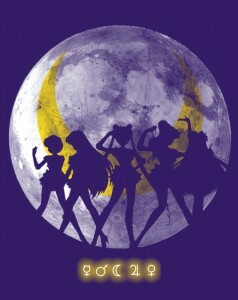 The shirt shows silhouettes of Sailor Mercury, Mars, Moon, Jupiter and Venus in front of the Moon. 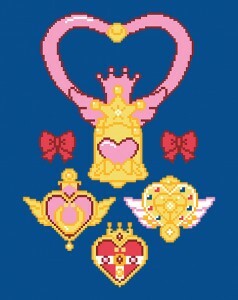 The symbols below that image represent Mercury, Mars, the Moon, Jupiter and Venus, but without parts of them being modified into hearts which is typical of these symbols when seen in Sailor Moon. 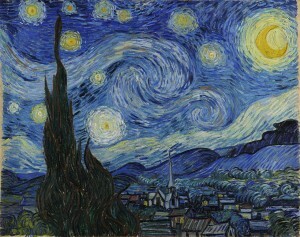 The artist is TeeKetch. Check out his Facebook page or Twitter feed for more of his work. 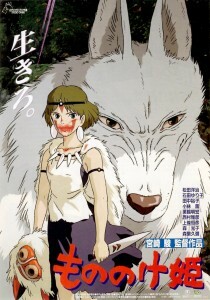 Today, December 1st, this great looking Princess Moononoke shirt featuring Sailor Moon as San and Luna as the Wolf Moro from Hayao Miyazaki’s Princess Mononoke will be for sale at Shirt Punch for $10. 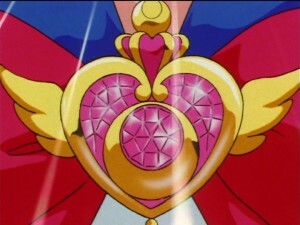 Sailor Moon’s mask seems similar to Sailor V’s and San’s knife is replaced with Sailor Moon’s Kaleidomoon Scope. The shirt’s artist is DiHA who also made the Teen Soldier Romance Comics and Tournée due chat noir be la lune shirts which we’ve posted about before. You can buy some of her stuff at her RedBubble store. Also check out her Deviant Art and Facebook pages. 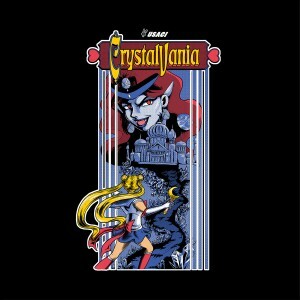 This “Usagi and the Starry Night” Sailor Moon shirt is for sale today, November 15th only, at Shirt Punch for just $10. 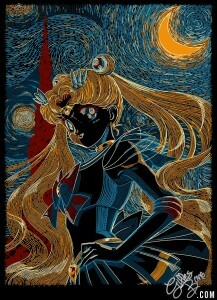 The shirt features Usagi as Super Sailor Moon in a style similar to Vincent van Gogh’s famous painting Starry Night. This shirt’s artist is Gilles Bonne who also designed the Attack on Moon shirt which we posted about in September. 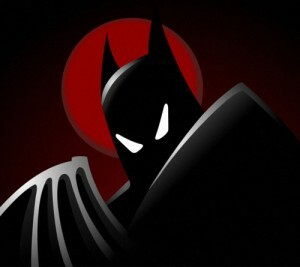 For more of his work check out his personal web site, Red Bubble store, Facebook, Twitter, deviantART or tumblr pages. 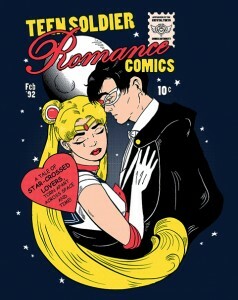 Today and today only you can pick up this very cool “Teen Soldier Romance Comics” shirt featuring Sailor Moon and Tuxedo Mask on the cover of an American style comic book at Shirt Punch for $10. The title seems to be a reference to “Teen Age Romance” comics which were published years ago. 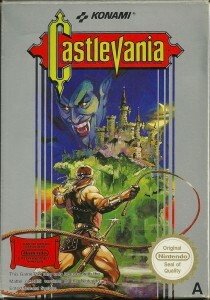 The date, February 1992, is about the time when the Anime first aired in Japan. As you can see the comic is approved by the Crystal Tokyo comics authority. This shirt’s artist is DiHA. Check out the original piece that this shirt was based off of. 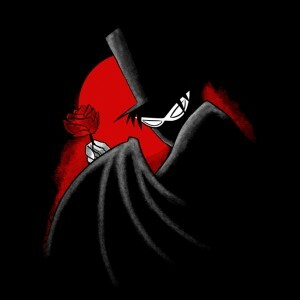 She previously did the “Tournée du chat noir de la lune” shirt which has sold on various shirt a day sites. You can buy that and other products she’s sold at her RedBubble store. 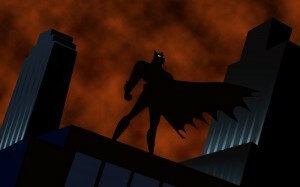 You can also check out more of her works on Deviant Art and Facebook. 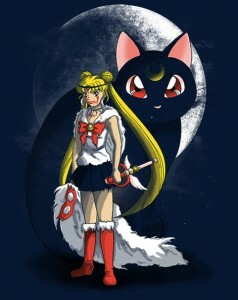 Check out this “Pretty Guardian Trainer Jupiter” shirt featuring a mash up of Pokémon and Sailor Moon. 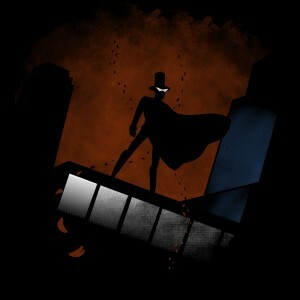 It’s for sale at ShirtPunch for only $10 but will only be for sale for 24 hours on October 18th. 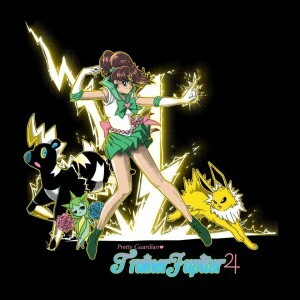 The shirt shows Sailor Jupiter as a Pokémon trainer with the Pokémon Blitzie, Roselia and Jolteon in her team. The artist, Kinkwink, has already done similar shirts for Pretty Guardian Trainer Venus and Pretty Guardian Trainer Mars which are both still available at her Redbubble store. This shirt will also likely show up on that store once this sale is completed.